Vincenzo Nibali (Bahrain Merida) doesn't feel in shape since the fracture he suffered at the Tour de France. The Italian sits in 64th position of the General Classification at the Vuelta a España at 12 minutes and 33 seconds from Michal Kwiatkowski. The rider crashed during the 12th stage of the Tour de France on a stretch full of fans that caused him to hit the deck. The diagnose was a vertebra fracture that was fixed with surgery, but Nibali doesn't feel like himself yet. "When I push for a long time my back hurts," he told Italian newspaper La Gazzetta dello Sport. "It's like I'm suffering from a tendonitis. I'm worried and we will see if this will improve. As long as I keep feeling like this, I can't do much. I am also worried about the future." 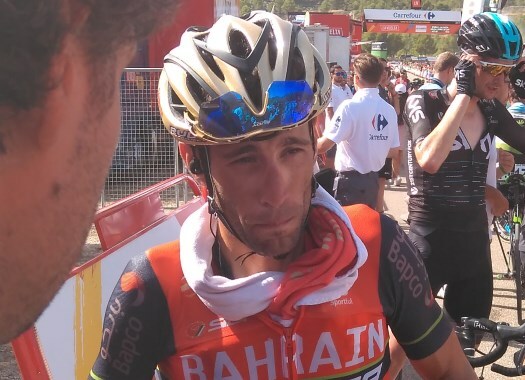 Nibali had the World Championships road race as one of the main goals of his season, but with the pain and after comments of fellow cyclists that have suffered the same injury in the past, he feels uncertain. "I've talked to (Fabio) Sabatini who told me that, by experience, the injury will leave some pain forever. (Ion) Izagirre told me the same, he also said that it took him months to get back to shape and that sometimes he can feel the pain. "I wonder if I will ever be the same again, if my back will be as it was. I wonder that since the day of the accident, it is normal. And I haven't got any answers to reassure me."